When I first joined Wizards R&D in the fall of 2016, I was given the rundown of all the future sets that we were going to release in the next two years. 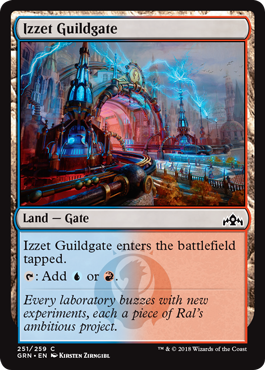 There was the wild world of Ixalan, then the nostalgic plane of Dominaria, but the one I was most excited for was Guilds of Ravnica. Ravnica has such a deep history and connects with so many different players. Identifying with a guild and its playstyle can immerse any player into the sprawling plane of Ravnica. 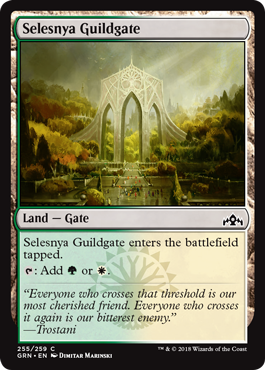 What better way is there to be welcomed back to Ravnica then a walk through the Guildgates? The evolution of set teams has come a long way since the beginning of making Magic. All of our main set teams now aim to have balance among skill sets and to be agile when more specialized help is needed. 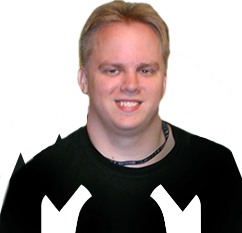 Erik was the set lead of Guilds of Ravnica. He has lead the most final Set Design teams of anyone in R&D. 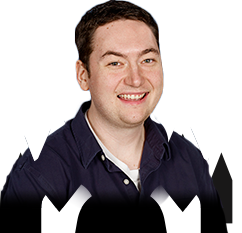 Not only is he a wealth of information to our department, but his footprint can be seen on all future Magic sets. Erik is also known to be an endless source of interesting facts. His favorite things are dogs, steak, and math, but you'll never guess the order! Ken brought the purest design aesthetics to the team. Ken is a veteran designer and the green member on the Council of Colors. "Man, how did he come up with something so awesome" was my normal reaction when I started working with Ken. That quickly evolved to "Oh, those are just normal Ken things." Ken also runs the Wizards of the Coast kickboxing club; he's a true Renaissance man. I like to think of Andrew as the Swiss army knife of R&D. 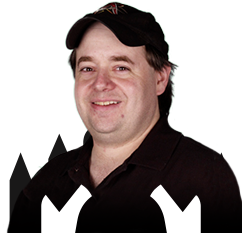 He has experience working on early design and has a history playing at the highest level of Magic competition. A rare combination of skills enables him to empathize with any player. Andrew is a good friend and owns an awesome propane grill that we use in the summer. Then there's me! 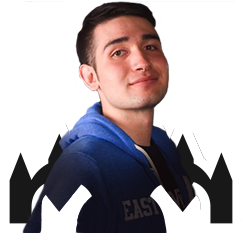 After a brief stint playing professional Magic, I traded it all to work at Wizards of the Coast. As a member of Play Design, my primary role on a Set Design team is to make sure that the cards are balanced for Limited and Standard. I'm a Boros personality who enjoys playing Dimir colors, so I'm a hodgepodge of everything. I enjoy puns, long walks on the beach, and hockey. 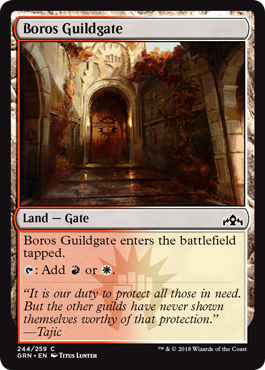 Guilds of Ravnica contains five different two-color guilds, therefore eight-player Draft environments do not support an even guild distribution. During initial playtests, we often found that two players were the only drafters of a certain guild. 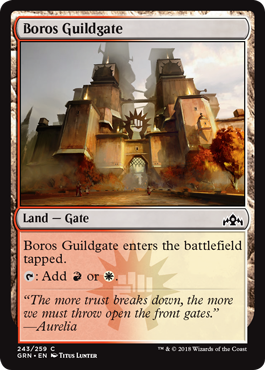 This would lead to an imbalance of gameplay, where the dominant drafting strategy is "be in the open guild." After these learnings, we increased the as-fan of Gates. "As-fan" is an R&D term, short for "as-fanned," that refers to how much of a characteristic shows up in an average booster. An as-fan of 1 would mean that we expect, on average, one card with that quality to show up in every booster (so for example, a basic land in many booster releases). 1.5 would mean that on average, one-and-a-half cards of that quality show up. Fractions can occur because we're averaging across all the boosters. Five boosters having one and five boosters having two is an average of 1.5. 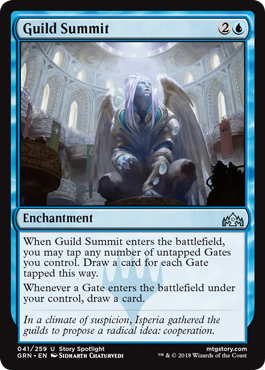 Our goals for increasing the as-fan of Gates was to increase the probability of there being five guild drafters and three three-color drafters. This allows more creativity for experienced drafters but still leaves enough space for novice drafters to stick to a guild. This also lets players learn and discover more of what is possible with every consecutive draft. You can start with a linear Boros aggressive deck, upgrade to a Dimir control deck with a red splash, and potentially graduate to five-color Guildgate control. When we increased the as-fan of Gates, sometimes during playtests one player would not play all the Gates they drafted. We then set out to create some rewards for that exact player. Here was the first incarnation we tried. 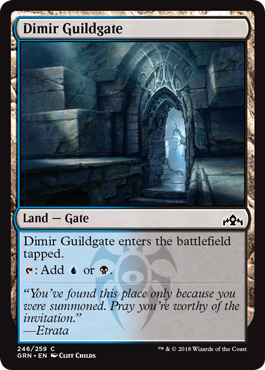 Draw a card for each gate you control. The first problem we encountered with this design was the tension of whether you drew your Gates or not. In some spots, it would be a ridiculous, over-the-top game ender. In other scenarios, it would sit in your hand before you were incentivized to cast it. Swingy, high-variance designs can be fun and exciting, but we went with something more reliable given the volatile nature of a four- or five-color deck. Guild Summit has the right amount of yin and yang for the early and late game. 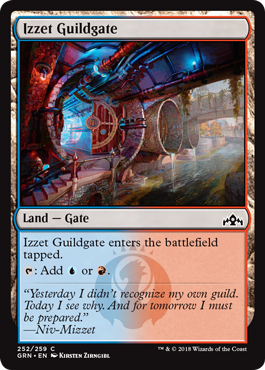 If you play it early, each subsequent Guildgate draws you a card. Then in the late game, it can be used as a big draw spell to reward you for playing your early Guildgates. As a competitive player, sometimes I'm more enamored by the cards that enable your rewards rather than the huge rewards themselves. There's no milkshake without a blender, and there's no mana fixing without District Guide. I am a huge fan of District Guide. I love cards that help progress regular games of Magic in a healthy way. 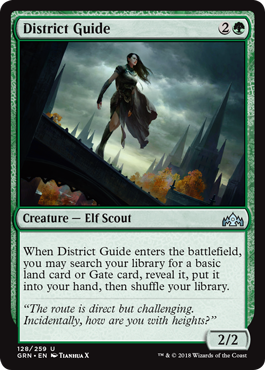 District Guide can function as a normal creature that finds your one or two Guildgates, or it can facilitate crazy multicolor decks by finding the color that you need. Speaking of the Guildgates, I think it's about time I showed them all to you! 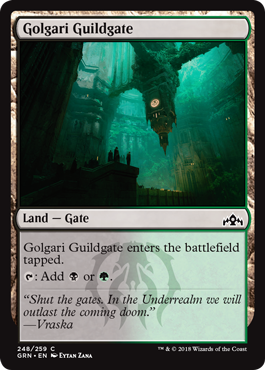 There are two versions of each Gate in Guilds of Ravnica. One depicts the open front of the guild itself and its public image. The second is the back-alley clandestine entrance, where secret deals and intrigue abound. My next article will be about the Guilds of Ravnica focus period in the Future Future League. In the meantime, feel free to shoot me some messages on Twitter! I'll also be at most Pro Tours and nearly all the West Coast Grand Prix, so come say hello.